T. M. Browning defined "religious communism" as a form of communism that "springs directly from principles native to a religion", and Hans J. Hillerbrand described "religious communism" as religious movements that advocated "communal ownership of goods and the concomitant abrogation of private property." Browning and Hillerbrand have also distinguished "religious communism" from "political" and "economic" socialism. Additionally, Hillerbrand has contrasted "religious communism" with Marxism, an ideology that, according to Hillerbrand, called for the elimination of religion. Donald Drew Egbert and Stow Persons have noted that "[c]hronologically, religious communism tended to precede secular [communism]". However, other scholars have also suggested that communism has always involved religious ideology; Marcin Kula, for example, has argued that communism "was never and nowhere free of quasi-religious elements." The term "religious communism" has been used to describe a variety of social or religious movements throughout history. For example, "the commune of early Christians at Jerusalem" has been described as a group that practiced "religious communism". The teachings of Mazdak, a religious proto-socialist Persian reformer, have also been referred to as early "communism". According to Ben Fowkes and Bulent Gokay, Bolshevik Mikhail Skachko stated at the Congress of the Peoples of the East that "the Muslim religion is rooted in principles of religious communism, by which no man may be a slave to another, and not a single piece of land may be privately owned." Some scholars have used the term "religious communism" to describe a number of 17th-century Protestant movements that "disavow[ed] personal property". For example, Bhabagrahi Misra and James Preston described the "religious communism of the Shakers" as a "community in which all goods are held in common." Larry Arnhart described "religious communism in the Oneida Community" as a system where "[e]xcept for a few personal items, they shared all their property." In fact, Albert Fried wrote that "American religious communism reached its apogee" in the 1850s "[w]ith the rise of the Oneida community". Other scholars have used the term to describe a communist social movement that developed in Paris in the 1840s, which was organized by "foreign-born, primarily German-speaking, journeyman-artisans who had settled there." 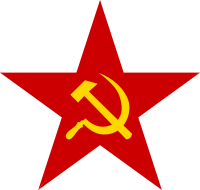 In the early twentieth century, prior to the rise of Bolshevism in Russia, some intellectuals advocated for the implementation of a form of communism that incorporated Christian ideology "as an alternative to Marxism". Additionally, in the late twentieth century, some Catholic theologians also organized groups to create "dialogue" between the Catholic Church and the Communist Party in Italy. 1 2 3 Browning, T.B. (1878). "Communism". The Canadian Monthly and National Review. 13: 577. Retrieved June 23, 2016. 1 2 3 4 Hillerbrand, Hans J. (2004). Encyclopedia of Protestantism. Routledge. p. 800. ISBN 1135960283. ↑ Egbert, Donald Drew; Persons, Stow (2015). Socialism and American Life. Princeton University Press. p. 91. ISBN 1400879892. ↑ Kula, Marcin (December 2005). "Communism as Religion". Totalitarian Movements and Political Religions. Taylor & Francis. 6 (3): 371–381. Retrieved June 23, 2016. ↑ Wherry, E.M. (1896). A Comprehensive Commentary on the Quran and Preliminary Discourse. K. Paul, Trench, Trübner, & Company. p. 66. ↑ Fowkes, Ben; Gokay, Bulent (2014). Muslims and Communists in Post-Transition States. Routledge. ISBN 1317995392. ↑ Bailey, Liberty Hyde (1909). Cyclopedia of American Agriculture: Farm and community. Macmillan. p. 299. ↑ Chase, Daryl (1938). The Early Shakers: An Experiment in Religious Communism. University of Chicago libraries. ↑ Guarneri, Carl J. (1994). The Utopian Alternative: Fourierism in Nineteenth-century America. Cornell University Press. p. 82. ISBN 9780801481970. ↑ Morgan, John H. (1978). "Eschatological Living: Religious Experience in the Shaker Community". In Bhabagrahi, Misra; Preston, James. Community, Self and Identity. Walter de Gruyter. p. 175. ISBN 3110802651. ↑ Arnhart, Larry (1998). Darwinian Natural Right: The Biological Ethics of Human Nature. SUNY Press. p. 92. ISBN 0791436942. ↑ Fried, Albert (1993). Socialism in America: From the Shakers to the Third International : a Documentary History. Columbia University Press. p. 30. ISBN 0231081413. ↑ Lindemann, Albert S. (1984). A History of European Socialism. Yale University Press. p. 77. ISBN 0300032463. ↑ Baird, Catherine (April 1995). "Religious Communism? Nicolai Berdyaev's Contribution to Esprit's Interpretation of Communism". Canadian Journal of History: 29–47. Retrieved June 23, 2016. ↑ Girargi, Giulio (Autumn 1988). "Marxism Confronts the Revolutionary Religious Experience". Social Text. Duke University Press. 19/20: 119–151. JSTOR 466182.